All transactions are safe and secure with a reliable history in online purchasing behind each of our associates. Buy the Fairy Tales Fiction t-shirt to own Pulp Fiction clothing and merchandise. Forget a kiss, an adrenaline shot to the heart would have surely woken Snow White up. This Pulp Fiction t-shirt re-imagines the fairy tale with a Pulp Fiction twist. Instead of overdosing on heroin like Mia, Snow White overdosed on a poison apple. Too bad Lance (Eric Stoltz) wasn't around to help revive her. Pair the design with Red Apple Cigarettes Pulp Fiction merchandise like hoodies and mugs. 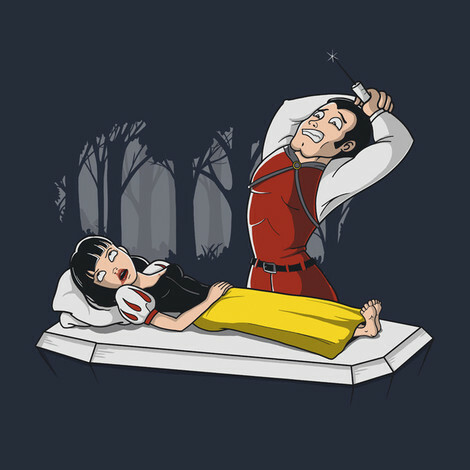 In addition to the Fairy Tales Fiction tee above, browse the Pulp Fiction Clothing Gallery for more apparel like men's and women's clothes, kids shirts or hoodies.